Lagos State Government on Tuesday met with its bond trustees and other stakeholders of its Bond Issuance Programmes with a promise not to renege on its repayment obligation to the various bondholders as it continues to provide the requisite infrastructure that would match the status of the State. 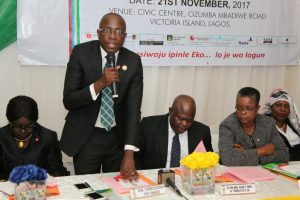 Speaking at the 2017 Annual General Meeting, AGM, of the Lagos State Debt Issuance Programme, the Commissioner for Finance, Mr. Akinyemi Ashade, explained that the bond issuance programme was undertaken by the State Government to consolidate the delivery of sustainable and inclusive economic growth and development across the State. According to him, the State’s limited resources and challenging economic climate makes it compelling for the State Government to explore the options of other financial sources from the capital market through a series of bond issuance programmes to support the government’s developmental agenda. While saying that the State government has built a reputation as a very responsible issuer and player in the Nigerian capital market over the years, the Commissioner assured the stakeholders that the present administration will continue to ensure that the sinking fund accounts created to secure the continued servicing of coupons and repayment of the principal amounts are adequately funded. “The strong commitment and consistency of Lagos Stategovernment in servicing all coupon obligations clearly reflected in its ratings both locally and internationally.Lagos State is currently rated ‘B+/negative’ and ‘A+ (ng)/stable’ by Fitch Ratings Agency and Global Credit Ratings (“GCR”) respectively. In addition, its N80 billion and N87 billion issuance were rated ‘AA-(ng) (stable)’ by GCR, and ‘Aa-‘ by Agusto & Co” he stated. Ashade promised that the bond would be used strictly for the execution of infrastructural projects in key areas like Transportation, Environment, Power among others, such that the State will continue to receive best ratings within and outside the country and will also enjoy the benefits of borrowing at a much-reduced rate. The Commissioner expressed the hope that as the State’s infrastructure increases through the intervention of the bond initiative, the delivery of sustainable economic growth and prosperity of Lagosians would also become more visible and its effect far-reaching on the populace. He thanked the Bondholders for supporting the State Government in its quest to bridge the infrastructural needs of the State saying, “The infrastructural deficit of the State is high, which explains why we are working assiduously to increase our Internally Generated Revenue, IGR and it is also expedient for Lagosians to live up to their civic responsibilities by paying their taxes”. The Commissioner also said that the State government is also reviewing some of its revenue laws promulgated some decades ago in order to align the laws to meet up with current realities. The bondholders and regulators unanimously affirmed the judicious use of the Bond by Lagos State government, saying that the Bond undertaken by the issuer will further make life meaningful for the residents of the State. Some projects already executed with the various bonds as well as ongoing ones include reconstruction of Lagos-Badagry Dual Carriageway (Lot 2A), Reconstruction of Ishasi Road in Ojo LGA, Reconstruction of Ijegun-Isheri-Oshun-Isolo Road, upgrading of roads within Apapa, Reconstruction of roads within Mushin and the Development of 47KM Lekki-Epe Express Road. The bond will also cover the construction of Adiyan Waterworks Phase II, Shoreline Protection Works, Completion of Ayinke House, and Construction of the Lagos Rail/Mass Transit Project (Blue Rail) among others. The three Bonds undertaken by the State government are Lagos State N47 billion Fixed Rate Programme 3 (Series 1) Bond 2016/2023, Lagos State N80 Billion Fixed Rate Programme 2 (Series 1) Bond 2012/2019 and Lagos State N87.5 billion Fixed Rate Programme 2 (Series 2) Bond 2013/2020.